Friend: "Oh man, Nick. What is this little poofy thing you've made?" Me: "Ummm we call it a Parmesan Puff. I wish I could tell you it's something fancy...but it's not." Friend: "Who cares! What's in it?" Until now, I have always been apprehensive to answer the age old question of; "Hey this is tasty, what's in your recipe?" I've been so guarded because this particular recipe is not complicated, nor is it fancy. Regardless, it wins over the crowd every time, and even has the appearance of being classy! I'm talking, of course, about Parmesan Puffs. This delightful treat has been made at the Kaiser's lake house (devoured), New Year's parties (demolished), and even a cooking group my mom participates in (also gorged). It is one of the easiest appetizers around, and if you have a friend to help you spread and cut the pieces, the whole process can take under 15 minutes. Preheat oven to 425 F. Remove crusts from bread (cut them off, don't peel) and lay bread flat on a clean working surface. In a small bowl, combine mayonnaise, Parmesan cheese, and scallions. 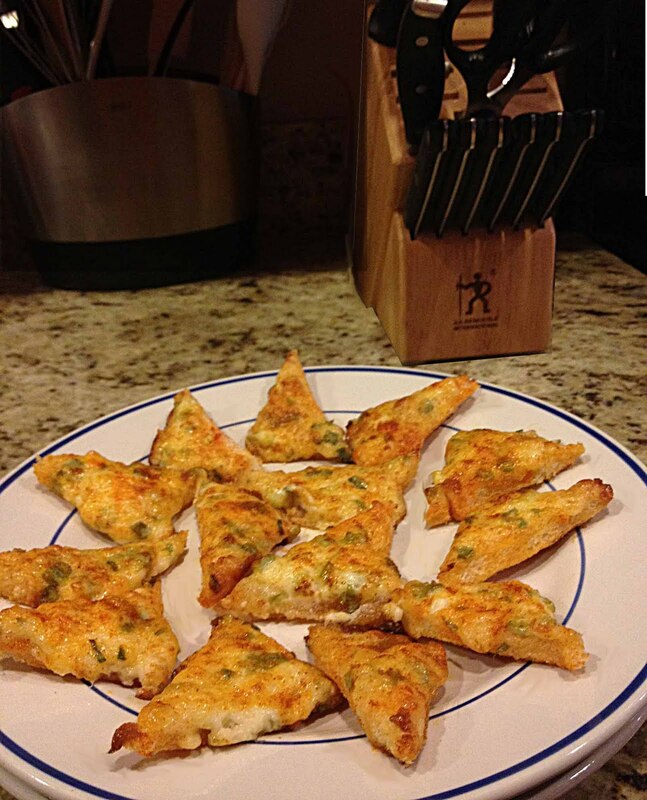 Spread a nice even layer of cheese mixture over each bread slice, sprinkle with paprika, and cut into quarters. Arrange on a baking sheet and bake until bubbly hot and golden, about 10 minutes. Makes 28.